What we see in front of a Church, often reveals the emphasis of the overall Church service. When we come into any Church, the symbols we see tells us what the leadership deems most important. 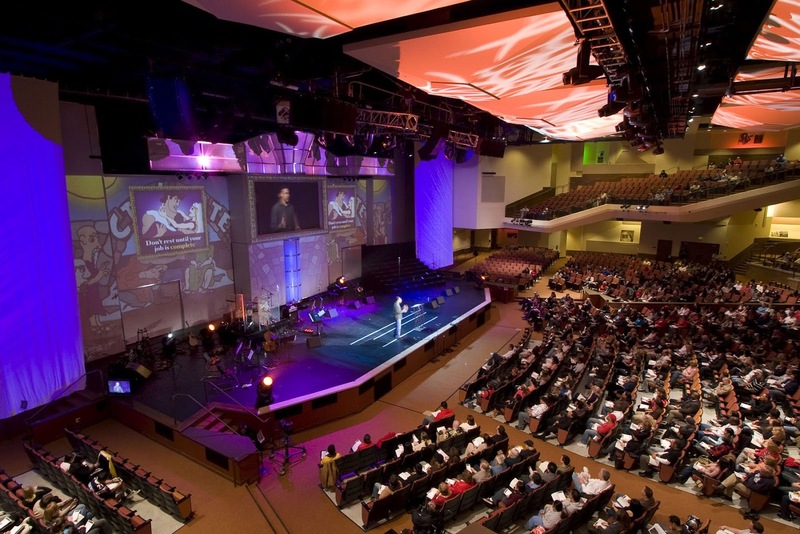 If a Church has primarily a huge musical setup visibly in front, a full band, complete with speakers all with sen-surround effects, and lighting atmosphere, one suspects that singing, music and the user experience is the central focus of that Church. If the Church has a posh cinema-like environment, the core emphasis is the conduciveness of a worship environment to aid people experience. Some may even accuse these as entertainment places. Instead of modern high-tech arrangements, some churches prefer the expression of sacred liturgy and traditional images of the Cross, the Communion table, and the visible image of Jesus. 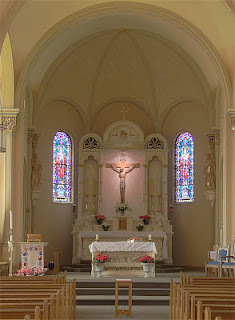 In such a setup, one may see liturgy as the primary focus to aid the remembrance via tradition. Many Roman Catholic and Eastern Orthodox churches will have such levels of emphasis. 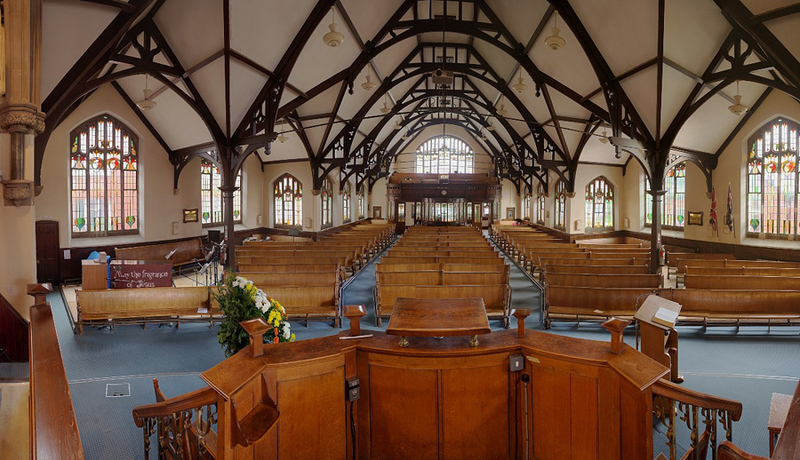 Some Anglican churches will share some commonality like painted windows, visible crosses, and a familiar dome like architecture. In these places, the pulpit is often moved to the side, in order to avoid blocking any views of the cross or the communion elements. Two primary symbols represent liturgical tradition in the Protestant movement. The first is the Eucharist, or the Communion sacrament. Some churches break bread every week. Others do so once a month. Occasionally, there will be the sacrament of Baptism. The second primary symbol is the sacrament of the Word. It is to this sacrament that I like to focus on this week. If the Church has a pulpit at the center in front of the sanctuary, one will not be wrong to see that the Word and the Preaching of the Word is the focus. This aids the preaching of the Word as central to the entire Church service. In some churches, there is a huge Bible on the pulpit to symbolize the centrality of the Word of God. The key task of the preacher is to proclaim Christ in preaching. The hearers are to respond to the prompting of the Holy Spirit as the Word falls on fertile hearts. The first preacher of course is Jesus, followed by the Apostle Paul, with the twelve disciples. The Early Church uses the word didache (teaching and learning) as a key mark of the Church. This word is commonly used to denote the teachings of the twelve disciples after the Resurrection of Christ. While not considered canonical enough to be included in the New Testament, it is instructional enough to be one of the major pieces of literature used by the early Christian leaders to teach the people. The work of preaching remains one of the core pillars of the Church. 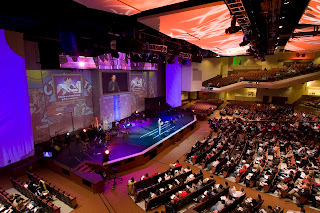 Imagine a church service where the Word is not central but peripheral to the entire service. Will that be Church? That will not be a Church that is built on solid Rock of Christ. One of the best things to happen to Christianity is the Reformation movement during the 15th Century. Many of us will credit people like Martin Luther, John Calvin, or Ulrich Zwingli for bringing the reading of the Bible from the hands of the Church to the hands of the common people. Our modern evangelical movement is a beneficiary of this. In the 17th and 18th Century, we have powerful preachers like John Wesley, George Whitefield, Jonathan Edwards to bring about the first great awakening. In the 19th and 20th Century, we have even more great preachers such as Lyman Beecher, Charles Finney, Charles Spurgeon, and the dynamic Scottish, James S. Stewart. Key to the revival of the masses is powerful preaching. If we study Church history, we will quickly sense that the powerful preaching of the Word is key to reformation. In modern America, we continue to see this trend of powerful preaching that leads to monumental growth in terms of Church attendance and spiritual revival. New York City has Tim Keller through the ministry of Redeemer Presbyterian Church. Southern California has Rick Warren through the Saddleback Church, Atlanta has Andy Stanley through North Point Community Church, and of course Massachusetts has Dr Haddon Robinson, who is my mentor for my doctoral thesis. One of the biggest reasons for anyone considering a theological education at Gordon-Conwell Theological Seminary is preaching. It is because of the conviction that the Word has to be proclaimed far and wide, clearly and accurately, that thousands of ministers have gone through training and teaching on preaching. Especially through Gordon-Conwell. One of Dr Robinson's conviction is this: "Until the biblical text has preached to me, I’m not ready to preach the biblical text to the congregation." This is the single most important thing that must happen to any preacher, before he can preach. I spend hours on the text weeks before I preach. I do not just read it. I think of it. I ponder over it. I dig into the text to understand the original meaning. This is the work of exegesis, where the original language is studied, the cultural context is drawn out, and the meaning of the passage is relived. This calls for patient waiting. The easiest way to understand spiritual listening is to allow the Word to shape our hearts. We hear the Word. We obey the Word. If I am preaching on love, consider how I have loved. If I am preaching on patience, consider how I have been patient. If I am preaching on idolatry, consider my idols. If I am preaching about an Old Testament text, consider how it looks like from New Testament perspectives, beginning with me. Robert Mulholland Jr says that Christian spiritual formation is "the process of being conformed to the image of Christ for the sake of others." I have always believed that the hardest part of preaching is not the preparation of the sermon contents or the delivery styles. The toughest is the preparation of the heart. This is why listening is the critical first step. Typically on a preaching week, I will first read the passage. I try to remember the key points of the passage, asking what the big idea is in the text. I use a dual-directional probe. Who is it for (ancient) and how is it applicable (contemporary)? What is it about (ancient) and what does it mean now (contemporary)? Why is the passage written (ancient) and why is it relevant now (contemporary)? I supplement my preparation with a recollection on the books I have been reading, asking the Holy Spirit to show me something, after considering the views of so many different brothers and sisters who have shared their gifts of knowledge through books and literature. If there is any panic day, Saturday will usually be the one. I consider the verses and the things happening in the Church that week. I pray for people. I then put together my research and ask the Spirit to show me the key idea or ideas in the text. Sometimes, I will have prepared at least three different versions, and decide which version on the Sunday morning itself. Only when the preacher has become a learner himself, can he move on the process of preaching. Proclaiming the Word through preaching is a core pillar of any church. This is one more reason why we ought to pray for our pastors and our preachers. We need to give them time to prepare, to study, and to get ready for the message each week. We need to pray for them, that they be protected against the temptations of the flesh toward pride, or the deception of the evil one toward other forms of idolatry. We need to give them as much support as possible, by being readers and obedient hearers of the Word. Perhaps, we can also share of our learning with preachers, so we too can be a part of this very important ministry of the Church. For the rest of us, suffice to say, pray for your preachers each week, and every week. Feedback to them regularly. You are only helping to strengthen the ministry of the Word in Pillar #2. One more thing. When the Word is preached well, while growing numbers are important, do not forget something much more critical, that our lives are changed by God's Word. May the Lord grant us more preachers who preach in the Power of the Spirit and proclaim the glory of Christ. For the kingdom. Hey Bro, thats a great post. As you say, the work of the Holy spirit in the one who preaches and the one who listens is paramount. :) The one who submits to the authority of the Holy Spirit while speaking the word can be assured that it is right. Thanks for your kind comments. Keep learning, and pointing out possible typos or errors. I make mistakes too. Have a great weekend.